There are some families who are tougher than others on their kitchen floor. There are different types of flooring available for your kitchen, what you have to do is determine which one is right for your household. Your family dog sprawls out on it while you cook, guests are scooting chairs across it and your kids play on it all of the time, your kitchen floor really does take a beating sometimes. So it is important that you do your homework and some research before you choose which type of flooring you want for your kitchen. 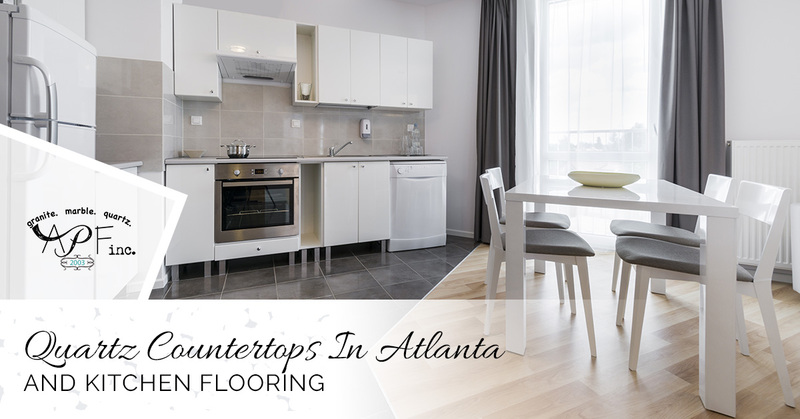 A Polished Finish, your source for quartz countertops in Atlanta, offers types of flooring for your kitchen. Concrete can be a beautiful option for residential kitchens. Concrete flooring is tough. And while it can chip and scratch, it takes a lot of work to do so. A concrete floor that is sealed and properly maintained could last indefinably. Concrete floors can be mixed and set to achieve a nearly endless variety of textural effects and colors. Concrete floors are very hard, which means if you drop a plate on it, it is almost certainly going to break. It can also be uncomfortable to stand on a concrete floor for long periods of time. Depending on the amount of traffic, concrete floors should be sealed or waxed every three to nine months. Vinyl flooring comes in either sheets or tiles and is available in a wide range of styles and designs. The vinyl tiles are easy enough to install yourself, but the sheets will require professional installation. Vinyl floors are durable and they will last a long time. These type of floors are also easy to clean and are cushioned so they are more comfortable than concrete floors. Laminate flooring comes in a variety of styles, it is attractive and affordable. Laminate floors can be installed directly over your existing flooring which reduces the amount of labor. It is less expensive than other flooring options and is less prone to scratching than hardwood floors. If your laminate flooring gets wet for a period of time, it can cause warping and buckling. You can’t refinish your laminate floor and it has a short lifespan. Wood floors in the kitchen are making a huge comeback in remodeled homes as well as in new homes. Wood has always been a popular choice for flooring in a house. Wood floors are comfortable to stand on, they have a warm appearance and they are considered a wise investment. They are also easy to clean and require minimal maintenance. They will also last for a very long time. The downside to wood floors is that they are susceptible to water damage and scratches and are rather expensive to buy and have installed. Porcelain tiles are created with the color all of the way through the tile. This way, if it does become damaged, you are less likely to even notice. They are quite hard, so standing on them over a period of time will cause discomfort. Ceramic tiles are great if you are on a budget but you still want some style and flare. Ceramic tiles are inexpensive, durable and come in a plethora of colors and designs. Just like concrete and porcelain tiles, ceramic tiles are hard and can be unpleasant to stand on. If you drop a plate in it, it is almost bound to break. Ceramic tile floors are very slippery when they are wet. Cork flooring is highly sustainable and eco-friendly. Cork flooring is also soft and easy to walk on and it is a safe choice as it is slip resistant. The downsides to cork flooring are that it needs to be sealed every three to four years, the sun can discolor it and heavy furniture may cause indention. Stone flooring gives your kitchen a natural look. This type of flooring comes in a variety of styles and colors. Stone floors are durable floors that will last a very long time. Stone floors are also quite expensive and difficult to install. You should pair your new floor with quartz countertops by A Polished Finish, Give us a call today.